“Amazon Web Services (AWS) is a collection of remote computing services, also called web services that together make up a cloud computing platform by Amazon.com since 2006. The most central and well-known of these services are Amazon EC2 and Amazon S3. The service is advertised as providing a large computing capacity (potentially many servers) much faster and cheaper than building a physical server farm. 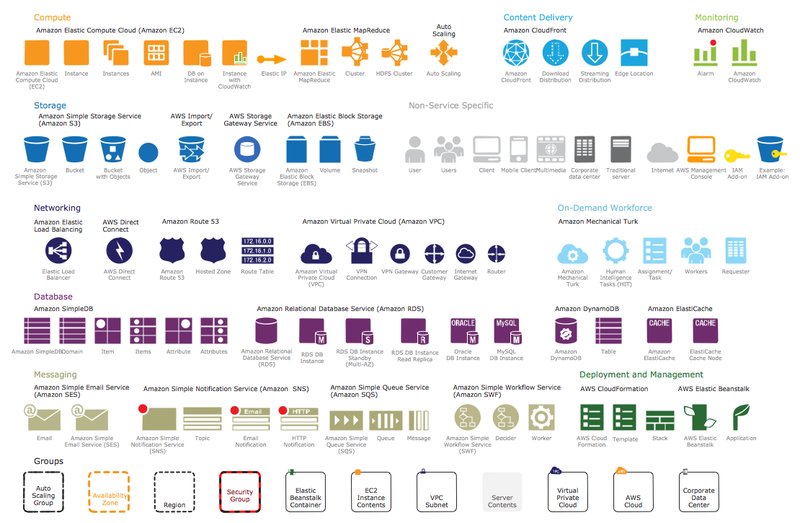 The AWS diagrams are convenient way for explaining the work of Amazon Web Services. ConceptDraw DIAGRAM diagramming and vector drawing software offers the AWS Architecture Diagrams Solution from the Computer and Networks Area for fast and easy creating the AWS diagrams of any complexity. which include several groups of icons: Compute, Content Delivery, Monitoring, Storage, Non Service Specific, Networking, On-Demand Workforce, Database, Messaging, Deployment and Management, Application Services and Groups. 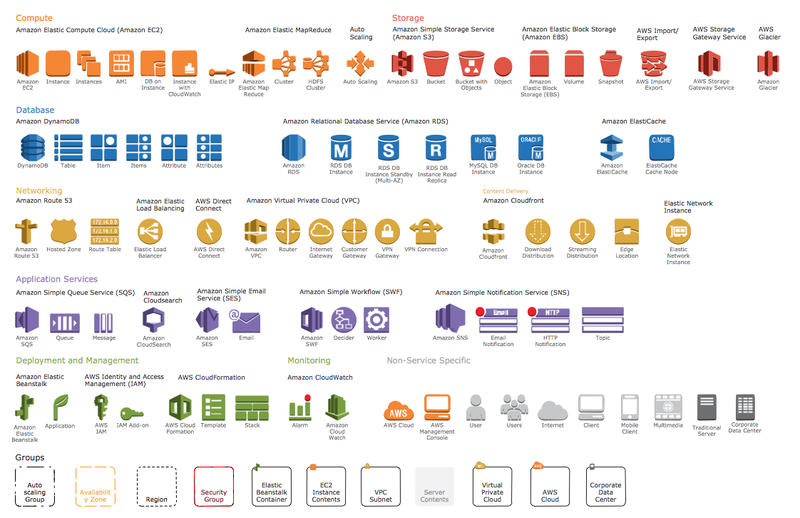 Numerous predesigned amazon symbols offered by AWS Architecture Diagrams Solution libraries will help you design your AWS diagrams in minutes. Simply click and drag them from the libraries to the document. AWS Architecture Diagrams Solution contains also a variety of helpful examples and samples of AWS diagrams. Find them all in ConceptDraw STORE. The AWS architecture diagrams you see on this page were created in ConceptDraw DIAGRAM using the tools of AWS Architecture Diagrams Solution for ConceptDraw Solution Park. An experienced user spent 10-15 minutes creating every of these samples. 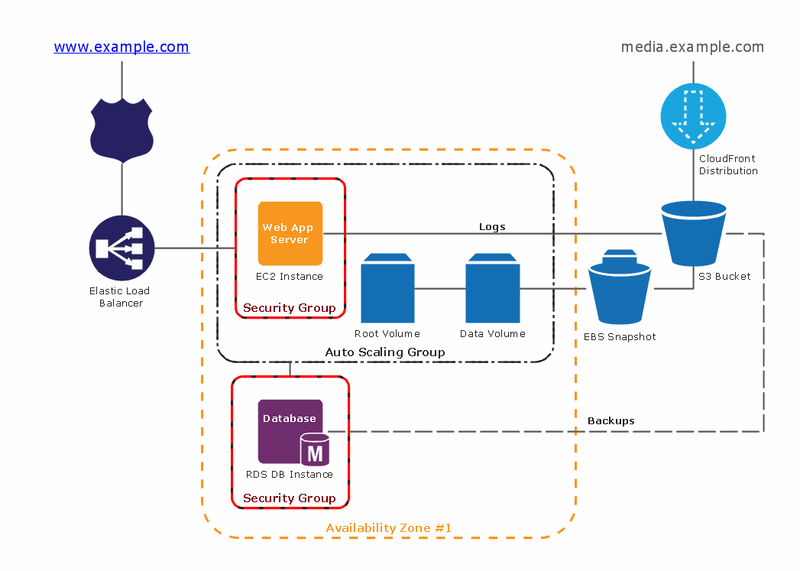 Use the AWS Architecture Diagrams Solution for ConceptDraw DIAGRAM software to create your own professional looking AWS diagrams and illustrations quick, easy and effective, and then successfully use them in your work activity. All source documents are vector graphic documents. They are available for reviewing, modifying, or converting to a variety of formats (PDF file, MS PowerPoint, MS Visio, and many other graphic formats) from the ConceptDraw STORE. 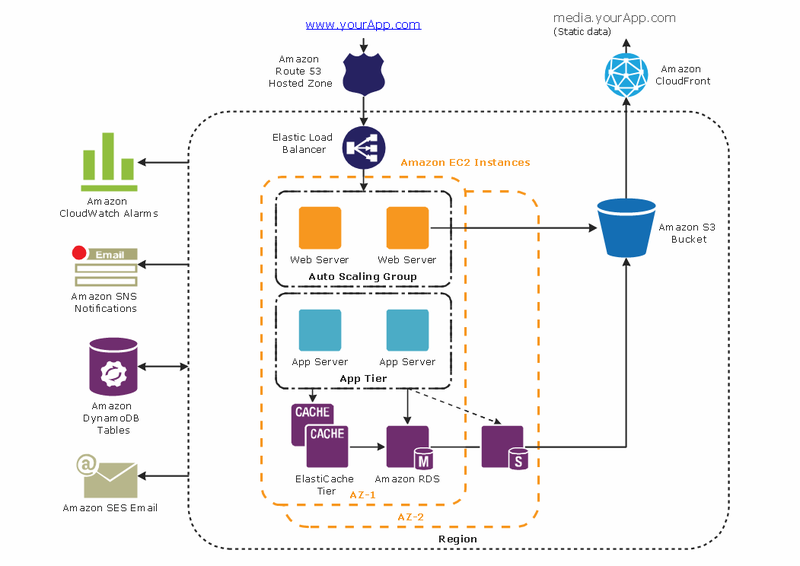 The AWS Architecture Diagrams Solution is available for all ConceptDraw DIAGRAM or later users.